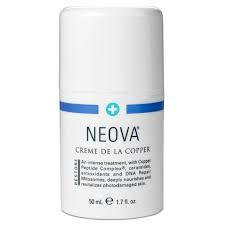 Neova Creme De La Copper is an intense moisturizer that penetrates deep into your skin. Neova Creme De La Copper is loaded with copper peptides and botanical extracts to give you a firmer and more rejuvenated complexion. The ceramides, bioflavonoids, jojoba oil and grapeseed extract delivers moisture to your skin giving it more elasticity while the antioxidants provide protection from further damage.